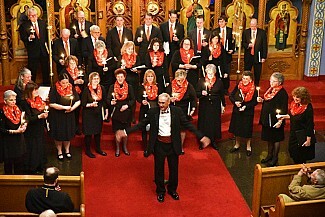 On Sunday, December 17, the choir at St. Nicholas Orthodox Church in Bethlehem, PA presented its Christmas Choir Concert. Under the direction of our distinguished Choir Director/Reader Nick Lezinsky, the choir beautifully sang songs of the Nativity and other seasonal favorite Russian Christmas carols. The choir concert showcases our talented choir and draws many visitors from the surrounding Orthodox churches and communities.